“Turkey supports and will continue to support Azerbaijan in the resolution of the Nagorno-Karabakh conflict,” added Erdogan, according to the Trend news agency. Erdogan said that presently, Azerbaijan is Turkey’s most important ally not only in the political and economic sectors, but in many other realms. Erdogan stressed that presently relations between the two states continue and the roles of the national leader of Azerbaijan Heydar Aliyev and the President of Azerbaijan Ilham Aliyev here is irreplaceable. “We will continue to expand our ties and implement various projects. 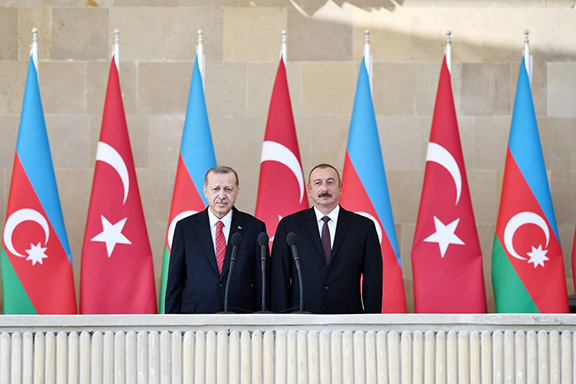 The joy of Azerbaijan is our joy, the problems of Azerbaijan are our problems,” the Turkish president added. Erdogan noted that Azerbaijan is a fraternal country, which has the largest number of graves of the fallen Turkish soldiers. “Turkey and Azerbaijan are two sons of the same mother and are brother states. Azerbaijan and Turkey have a common past, religion and language. Our participation in the parade today is a symbol of our brotherhood and the fact that 100 years ago the Turkish soldiers fell here fighting,” Erdogan added. The same way Russia must support Armenia. Russia doesn’t support Armenia. If that was the case, they wouldn’t have supplied Azerbaijan with weapons as well. Russians have never been our friends. During the Bolshevik times when we were in war with Turkey, the Soviet Union signed a peace treaty called Treaty of Lausanne, which replaced the Treaty of Serves because Turkey rejected the Treaty of Serves and ignited another war so a treaty can come in their favor. Turks are nothing but power hungry hypocrites. More is never enough for them. We will inevitably have full control of Nargorno Karabakh and 7 adjacent regions and there’s nothing Azebaijan, Turkey, or any country can do about it. Our people will fight and drop every last drop of blood to preserve our land. If there’s one thing we Armenians have that the rest of the world doesn’t, is resilience. We are the derivative of the word resilient. No matter how many Armenians you kill, you can never ever defeat for once and for all. Turkish and Azerbaijan arrogance what fuels motivation for Armenians. President Erdogan firmly believes in Islamic solidarity, not only with Azerbaijan but with all Islamic nations. Contrast this with Jens Stoltenberg, a former Prime minister of Norway of German ancestry, who serves as the Secretary General of NATO. Stoltenberg cares not if Turkey and Azerbaijan overrun Christian Armenia and finish the job that was unfinished 1915-1923, the annihilation of the Armenian people. He was in Washington shoring up Turkey as a key member of NATO. Wasnʻt NATO established to protect against the Soviet threat? Turkey and Russia are now strong allies. Does President Trump have a point in viewing NATO as a dinosaur? This comment coming from a strong Democrat who views each issue individually. Long live free Nakhchivan and Western Armenia! Now let’s see is Putin will step up to the plate and declare “Russia supports and will continue to support Armenia in the resolution of the Nagorno-Karabakh conflict”……..I wouldn’t hold my breath! “Turkey and Azerbaijan are two sons of the same mother and are brother states.”….what an idiotic thing to say. That only implies that their mother is a prostitute. The proper expression is “brother from a different mother”. Best news from Erdogan so far. Keep the border closed and keep Armenia safe! Thank you for not opening the border. Never open borders , it is very bad , all turkish and azeri spies will flood the Armenia, So many years Armenians did well with close borders, and never Artsakh should be given to Azeris, above pictured two killers of humanity dictators, let them go to hell. burn in hell forever. This Turkish Islamo-fascist charlatan mullah and terrorist-in-chief Erdogan sure knows how to speak from his rear end. These two terrorist countries, one illegally established in occupied Western Armenia for Central Asian Turkish criminals as a result of premeditated Armenian Genocide and the other artificially invented on occupied Eastern Armenia for former homeless Caucasian Muslim criminals, have absolutely NOTHING in common. The only thing that brings them together is a common enemy and pan-Turkism. These two terrorist states neither have the same past nor the same religion. Up until the collapse of the Soviet Union, for seventy years, they had no contacts with each other and their people were strangers practically. In terms of their religions, one is Sunni and the other Shia which means they have been religious enemies for 1,400 years since the 7th century. They can at best be described as: The enemy of my enemy is my friend. They act “fraternal” because any action one takes against the Armenians helps the other. AND if terrorist Erdogan and coward Aliyev are from the same mother that means either Erdogan’s mother was having an affair with Aliyev’s father or vice-a-versa! Rely upon no one but ourselves. THAT is the lesson of the Armenian genocide. Turks will not stop. All others nations are unreliable including Russia. Why are we so concerned about others coming to our aid? Why isn’t Armenia creating a clandestine a nuclear weapons program???? Don’t be afraid of damaging Turks. They bleed easily. They will deserve every bit. Political chess game! Armenia needs to keep a balanced relationship with East, West, North and South. The main lesson of the Armenian genocide, is we must learn to rely on NO ONE but ourselves. Instead what do Armenians do? The majority of self hating that marry non Armenians and do NOT raise their children as Armenian if they even have children, most only have 1 or 2. Contrast this to the jews who not only have tons of children but do EVERYTHING possible to give Israel an advantage! Are you telling me that Armenians are no better than the jews? Why aren’t Armenians lobbying like crazy to promote the interests of Armenia beyond genocide recognition? Why isn’t the diaspora encouraging Armenians to repatriate back to Armenia? to invest in Armenia? to bring their talents and skills to Armenia? To lobby for Armenian causes? To strengthen the Armenia economy? To promote ties with China and Iran? To keep Russian support but change the Russian viewpoint from viewing Armenia as a vassal state to viewing Armenia as an equal? Why aren’t we having more children with fellow Armenians and raising them as purely Armenian? The only thing that jews have over Armenians is that when it boils down to it, they put aside ALL their differences (and trust me the differences are considerable) and to EVERYTHING possible to help Israel. Armenia should in a sense follow this example!